The Screaming Pope: Won't You Be My Neighbor? Was Fred Rogers as loving and accepting of his own feelings and faults as he told children to be? In fact, can anyone be? It’s a question that lurks beneath the surface of Morgan Neville’s Won’t You Be My Neighbor? To take a negative view of human potential is to ascribe to nihilism, but what was the reality of the kindly Fred Rogers who said things like “you don’t have to be anything sensational for people to love you,” “what is essential in life is invisible to the eye,” “silence is one of the greatest gifts we have”? Rogers swam a mile every day at the Pittsburgh Athletic club and his weight always came out to be 143 pounds. With the one standing for “I,” the four, “love” and the three, "you,” it's a neat little package and for all Won’t You Be My Neighbor's? charm, you might wonder if things don’t fit together a bit too tidily. Using Rogers' own epistemology of acceptance and self-love, one would be hard put to get by the board of the metaphoric gated community he lived in. Still certain images leave an indelible impression, amongst them the trolley that continually leaves and comes back. What better nostrum for separation anxiety and what better iteration of Winnicott’s famed transitional object than Roger’s familiar sock puppet? (Luminaries in the field of child development like Benjamin Spock, Berry Brazelton and Erik Erikson all are cited in the movie). Then there's the scene of the congressional hearing where Rogers totally melts the thick-skinned Senator John Pastore, thereby securing the $20 million subsidy that was so necessary to public television’s future. Rogers was an ordained minister and the movie portrays him as the unassuming side of the superhero. Though he had to possess a certain degree of drive to produce a project of such magnitude and appeal, he was a televangelist for a good cause--kindness. “I want there to be peace in the neighborhood,” is one of the movie's many mantras. “It’s been a hard time for everyone.”Apparently Rogers found relief on the set of his own show. 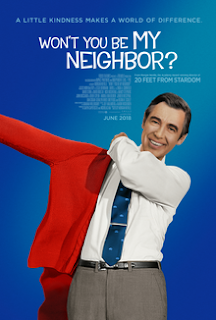 Will You Be My Neighbor? is the legacy of an era when peace and love were still considered viable philosophical positions.